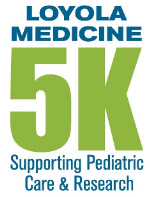 On behalf of the thousands of families who turn to Loyola each year to care for their sick or injured children, thank you for registering for the Loyola Medicine 5K. You've already taken the first step in becoming a hero for our pediatric patients and their families. Way to go! Because of your participation, we are able to provide the best care for the tiniest of infants in our neonatal unit to the most critically-ill children in our pediatric intensive care unit. Thank you.